Looking at Demographics from the New Orleans census in 2000, I see that there were more Black/African-American citizens than there were White/Caucasian at 67.25%. This explains its French culture during that time. This dropped a whopping 7% at the 2010 census leaving it at 60.2% with the white population increasing slightly to 33%. Also looking into the household totals from 2000 to 2010, by the 2000 census, the total households in New Orleans was at 188,251 with 60% of those are family households. At the 2010 census, the number of households had dropped to 148,398 which is a 21% decrease, mainly due to Hurricane Katrina that obliterated thousands of homes in its path. 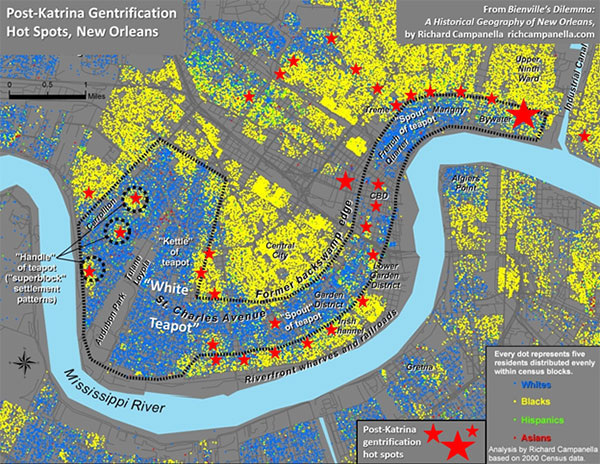 In the New Orleans census in 2000 the population was at 484,668. Around 7% of that population were people aged 0-4 years old. About 20% were people aged from 5-17 years old. The majority of the people, around 61%, were people aged from 18-64 years old. Lasty about 12% of the population were people 65 years or older. 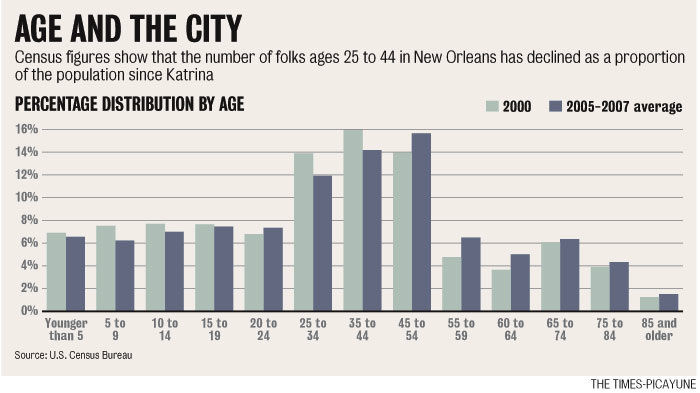 The median age prior to Hurricane Katrina was 33.1 years old. In 2010 the population had dramatically dropped to 343,829. The percentages of the different age groups did much change much during the 10 years, but the overall population did. The median income for people in New Orleans is $37,146 but in the Lower Ninth Ward, the average income is significantly lower. It drops to around $27,384 between all age groups. That is not even close to enough to good living standards, which explains why nearly all of it is poverty. With a 9% sales tax rate, the money there doesn’t go very far. The crime rate in the Lower Ninth Ward is ridiculously high compared to other places in the US. Just within the last week alone there have been nearly one hundred crimes including numerous shootings, many assault cases, and a lot of theft. 53.6% of the people in the Lower Ninth Ward have never been married while around 24.9% are. The rest of the population is either divorced, widowed, or separated. That is much different compared to New Orleans as a whole where 49.5% are married and 19.2% are not married. Statistics for the Lower Ninth Ward shows that in 2010, only 29% of people went to High School, less than a third of the population. On top of that, 11% of people haven’t attended high school whatsoever. College wise, only 26% of people have attended some sort of college in the Lower Ninth Ward, just at a quarter of the population. When coming to New Orleans for the first time, people would have a difficult time understanding the city. New Orleans looks unique compared to all the other places in the United States. What confuses people the most is the impression from the French Quarter, which is near most of the city's hotels. The French Quarter consist of cottages and townhouses which stand side by side and up against the side walk. In New Orleans people are out at all times of the day in the center of the city. The bars do not have a closing hour, spicy food is common, music is also a big factor to most places in New Orleans. The people of New Orleans have a slight accent, some people speak Southern American English, some others sound like they’re from Brooklyn. The economy of New Orleans is influenced mainly by a few primary categories which include, oil/gas (and related activities), the port and ship/boat building, aerospace manufacturing, and tourism. In the start of the twenty first century New orleans was known as one of the best places for minor businesses and entrepreneurs. Universities, hospitals, other professional services, installations of the U.S. Navy and other military operations in the area puts more diversity to the economic base of New Orleans. New Orleans is also a head in production of crude oil and natural gas processing facilities and major transportation center.